The young sailor from the lakes jumped at once to the shore, making his way to the place pointed out by Pathfinder. The canoes, meanwhile, were clear of the bushes, and permitted to drop farther downstream, until Jasper’s position was well out of sight. Then they stopped and waited. “Too much smoke—too clever. Indians no fools,” said Arrow­head, darkly. 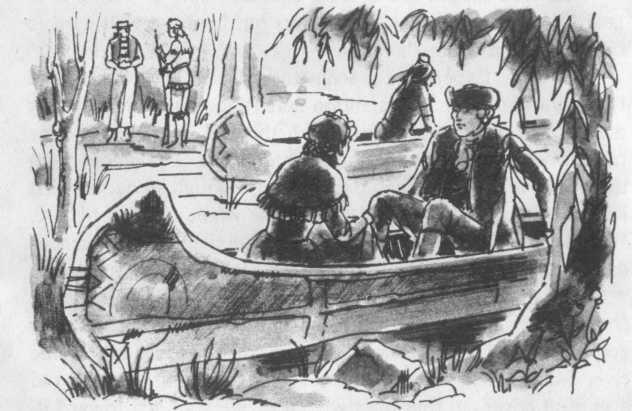 While speaking, Pathfinder permitted his canoe to float away from the bush, and in a few minutes another turn in the river completely hid from view the rising smoke. Fortunately, the river bank, which was rather uneven at this point, also offered a natural cover, so that the two canoes were guided toward it. A better spot could not have been found for the purpose. The bushes were thick and hung over the water, forming almost a complete cover of leaves. The only place from which they could be seen was from the other side of the river. Pathfinder, however, set about making their hiding place even safer. He and the Indian went a short distance into the bushes, where they cut off branches of various kinds, using great care not to make any noise. The ends of these branches were then forced into the bottom of the river, just in front of the canoes, the water here not being very deep. one passing by, but to shoot out directly from the bank, with only their curved ends dropping lightly into the water. In short, none but a very experienced eye would see the spot. This was proven a few minutes later when Jasper Western himself approached. He had finished lighting the fire, and re­turned to the place where he had first left the party. Seeing the canoes gone, he supposed that they had been dropped around the next turn of the river, in order to get out of sight of the smoke. He now walked knee-deep in the river, so as to leave no trail. He could be seen making his way down along the edge of the stream, looking curiously for the spot in which the canoes had been hidden. Those behind the bushes, by placing their eyes near the leaves, could find many places from which to see out—but any­one at a distance lost this advantage. Jasper was therefore un­able even to imagine where Pathfinder and the group were hiding. Just around the turn in the river, and out of sight of the fire he had lighted, he stopped and began examining the bank with great care. Sometimes, he would walk on for eight or ten steps, and then stop again and look into the bushes. In this way he came so near the branches that hid the group that he could have stretched out his hand and touched them. Still, he noticed nothing, and was passing the spot, when Pathfinder made an opening through the branches and called to him. “Don’t you think, Master Pathfinder, that it would be best, after all, to get under way at once and sail hard downstream as soon as we are satisfied that the devils are back of us?” asked Charles Cap. “Then let it be done,” said Mabel at once, rising to her feet. She insisted that she had no fear of making such a trip. Nor did she wish, she said, that any of the others should suffer simply because of her. 2. Why did Pathfinder think it would? 3. How did the soldiers show that they had learned nothing from experience? 4. Why did Pathfinder think they should find another cover? 5. Why was their new spot a good hiding place? 6. How did Pathfinder make it better? 7. How did he place the branches in the water? 8. How was it proved that their hiding place was good? 9. Why did Jasper walk in the water? 10. How close did he come to the hidden group? 11. Why didn’t Pathfinder want to leave their hiding place? 12. What did Mabel say she wasn’t afraid to do? 13. Why didn’t Pathfinder want to go on by land? Such being the opinion of Pathfinder, to whom they all looked for advice, no more was said on the subject. The party now broke up into groups. Arrowhead and his wife sat apart, talking in low voices. Pathfinder and Cap sat together in one canoe, speaking of their different adventures. Jasper and Mabel sat in the other canoe. In this way Jasper and Mabel got better ac­quainted in one hour than they would have in a whole year under other circumstances. The time flew by. Suddenly Path­finder waved to them all to be silent and asked Jasper whether he had not heard a sound outside. “The Serpent is coming,” said Jasper, looking out through the leaves of the cover. “Then let us see if Mohican eyes are better than those of a young man who follows the water,” said Pathfinder. The Mohican had, in fact, made his appearance in the same direction from which Jasper had come. Instead of coming di­rectly, however, he no sooner passed the turn in the river, where he was hidden from anyone who might be higher upstream, than he moved close to the bank. He then took a position from which he himself could look back upstream easily, yet without danger of being seen from above. Those within the cover watched in silence the movements of the Big Serpent, or Chingachgook, as he was also called. The Indian stood without moving a muscle for perhaps ten minutes. Then, having apparently seen something of importance, he drew back hurriedly and started downstream again. He kept close to the bank, but continued to walk in the water so as to leave no trail behind him. At the same time he looked carefully along the shore, where a canoe might be hidden. suddenly stopped, fastened his sharp eyes among the carefully- placed bushes, and took a few quick steps back. Then, pushing some of the branches lightly aside, he appeared among them. “The hated Mingos?” asked Pathfinder, as soon as his friend was close enough. When their private conversation was over, Pathfinder came over to the others and told them all he had learned. The Mohican had followed the trail of their enemies some distance toward the fort. When the latter caught sight of the smoke from Jasper’s fire, they immediately turned around and started back. Chingachgook hid himself quickly, and it was fortunate that the savages were so interested in getting to where the fire was that they paid little attention to the ordinary signs of the forest. They therefore passed him by. They were fifteen in number, and followed closely on each other’s footsteps. After reaching the spot where the Mohican and Pathfinder had talked, the Iroquois had struck off toward the river. This they reached just a few minutes after Jasper had disappeared behind the turn in the stream below. The smoke being now in full view, the Iroquois disappeared into the woods in different directions. Apparently, their idea was to approach the fire unseen from several sides at once. Chingachgook, meanwhile, made the most of this sudden chance to escape toward the river and started downstream. Having reached the first turn in the river, he stopped, as has been told, until he saw his enemies at the fire. They remained there, however, only a short time. Of the plans of the Iroquois, the Mohican could only judge by their actions. He thought that they understood the trick of the fire. In other words, they now knew it had been lit to con­fuse them, or perhaps draw them upstream; for after examining the spot carefully, they had separated. they would follow from this point, the Serpent could only guess. He had felt the situation too dangerous to wait any longer before looking for his friends. It was his opinion that their enemies wou d continue down along the edge of the stream, but he could notb< certain of this. A. 1. Into what groups did the party break up? 2. Who was approaching their hiding place? 3. What could Pathfinder tell from the Indian’s actions? 4. Who was better at finding the hiding place, Jasper or the Indian? 5. Who were the Indians who were on the trail? 6. What had the Indians done when they caught sight of the smoke? 7. How many of the Indians were there? 8. Why had the Indians gone into the forest in different di­rections? 9. How long did the Indians remain at the fire? 10. What did the Mohican think that they understood? 11. What had some of the Indians done? What had the rest followed? 12. What did the Serpent guess that they would now do?